Going from several nap times a day to maybe one per day can be a rough transition for the sanity of both parents and kids! Nap time is a necessity for young children! As parents, we get in the habit of having our child take 2-3 naps a day. Then one day you realize your little one is no longer in need of that much nap time per day. But this transition toward fewer naps is hard on their bodies. We know that kids actually do need this time to rest! 1. Make sure your child is going to bed at a decent time. Putting a child to bed at 11 pm at night is not going to help the one-nap-a-day situation. Your child’s body needs a certain number of hours of sleep per day. Take in account when your family must wake up and count backward. Here is a link to see the recommended number of hours your child needs based on their age. 2. Create a cool, dark, and quiet designated nap time area. Your child is not going to catch Zzzzs in a mess of a room, where the light is shining through the windows. a. Make your child’s nap space free of distractions. If your child is napping in their own room, get the toys out of there! I feel that having most toys out of children’s rooms is a great solution to ensure happy dreams. Leave the books though! Books can be a great tool in helping with children relax and transition to sleepy mode. Include one story in their nap routine, it can be helpful to buffer between wake and sleep mode. b. Get some of the light blocking curtains to make their room darker. There is even window tinting treatments you can put on your windows to help block light. Using one or both will help keep their room darker. c. Get a fan if your child’s room gets too toasty mid-day. This can also double as white noise which can be soothing. 3. Pick out some calming music if you think that could be helpful for your little one. I like to use a sound machine that has different noises. There are many out there you can purchase to fit your child’s specific needs. You could even set up an iPod with a sleep playlist with relaxing tunes. 4. IMPORTANT! Set up a nap time routine. • Nap time should occur around the same time every day. Children will get used to the schedule, which will help regulate both bedtime and nap time schedules. • Get the room nap ready: windows closed, fan on, and music ready. • Read one story while the child is in bed. This allows their body and mind to become relaxed and calm. • Say your good nights, and offer plenty of hugs and kisses. Sometimes a song and rubbing their head/back is what they need to get relaxed and in that sleepy mode. 5. Next, shut the door and go take a nap yourself! (Ha ha!) Get caught up on a book, do things around the house, take a shower. Take the time for yourself. 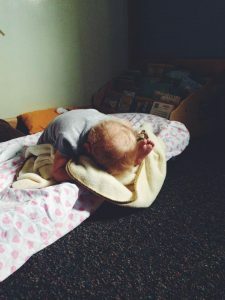 Sometimes there are kiddos who refuse to nap; if you feel your child still needs to nap then be firm with that. If they get up, put them back to bed. Talk to them about meeting their bodies needs, and recharging for the day. If they still refuse every day, put in place a rest time. They still need to be in their room; quiet, resting, and recharging. This little checklist can help in the survival of the nap time preschool years. Be sure to keep the routine of nap time the best that you can each day. Let your child know of their daily schedule. It will help prepare them for when nap time comes.